What is the joy in driving when you cannot take your car at any time of the day for a cruise especially when you own a masterpiece such as the Range Rover sports, just because you have bad headlights or an unclear visual lamp. Not only does it kill the vibe and enjoyment you get whenever you driving at night, but it also poses a threat to your life and your purse also. Driving at night or inclement weather is quite challenging without the necessary illumination you may not see another vehicle or obstacles in the roadway and other drivers and pedestrians may not see you also. Not only that, in some localities, you may fail a safety inspection for a damaged or non-functional headlight, and law enforcement officer will ticket, and maybe even impound vehicles they judge to be unsafe, and you will not want that to happen to your £100,000 Range Rover Sport. Besides the safety value of the headlights, the aesthetics, pleasure is worthy of note also, as the headlights add more qualifying attitude to the appearance of the Rover. Such as the 2016 Range Rover ’s headlight which aligns with the front grille to give a ‘don’t mess with me’ look or the Evoque’s ‘I might look cool but am dangerous’ look. Range Rover has always used the headlights to portray their intent when producing a car. The Range Rover sport in time past has been equipped with an ‘intelligent onboard electronic system’ which has served as a trail blazer for other cars. The headlights are not managed via positive and negative signals, but partially through data signals. Even though the indicators are a low beam, high beam, and direction +12V and negative, other functions are continuously supplied with 12V (even when the vehicle is off) so that the control lights on the headlights can always “hear”. However, the ignition signal is actually sent through the Lin Bus network integrated through a digital data cable. Therefore, the Range Rover ’s headlight are full-fledge computers that complete their own intelligence (brains) which can record and process data from one conductor. Well you can say it’s highly technological for a car that sources its power from petrol or electricity, but then, Range Rover is a trademark for futuristic technology, so even the minutest thing gets a taste advancement in their deployment. Leaving the past behind us, Range Rover ’s new headlights have incorporated new Matrix and Laser Matrix to work in a very similar pattern, but in four years now, they are much smarter. The optical unit is fully controlled by a large control unit under the lamp, which is always powered, as the signal needed to operate the LED is sent by the car. Due to various technological and individual researches, we have seen various private upgrade companies improving on the standard LED Matrix headlights by Rover, such that it is equipped with automatic high beam and consists of four groups of 10 LEDs with a total of 40 LEDs. Each LED projecting a vertical beam on the road, as each beam can be controlled to illuminate well-defined parts of the road. This is actually an optional choice as these upgrade companies are there for your ride to look unique when driving by. Speaking of upgrade companies, Enkahnz is a company specialized in styling, accident repair, vehicle customization sales of vehicle parts and so on. At Enkahnz (http://www.enkahnz.co.uk/styling/bespoke-designs/), we are dedicated to providing utmost pleasure and satisfaction to our customers with our works, not only that we are dedicated to giving you ultimate value for your money and you trust in us. With our team of highly experienced mechanics and technicians headed by a passion driven CEO Naveed Khan, perfection is a euphemistic expression. Also not only does Enkahnz redefine your driving experience, they also offer sales of OEM vehicle body part. In the light of our discussion about Range Rover headlights, Enkahnz got you covered The distinctive pixel Laser LED signature and smart high beam is the premium option on the new Range Rover and Rover Sport. The 71 pixel system provides excellent illumination of the road ahead without dazzling oncoming drivers. Jaguar ’s Land Rover ’s first plug-in hybrid vehicle and luxury SUV are equipped with premium LED headlights as standards. Customers can choose the Matrix LED package as an optional extra. The headlight which uses a 20 pixels to distribute the beam in vertical strips, each of which can be individually controlled. Bi xenon headlights which are more modern, efficient and cheaper to manage the system, comes as a natural choice for Rover users, as opposed to the yellow/orange slice the Xenon bulb produce. Although the xenon bulb is a bright, energy efficient and modern looking, the LED Bi xenon headlights is way better and brighter. After the launch of the innovative SMARTRIX module of Jaguar E pace, the Range Rover Sport has additional modules in their smart headlamp technology which makes longer lights clearer and lower rays more dynamic, apart from making it easier easy to be seen and to see. Owners of the Evoque 2016 with halogen headlight instead may want the option of full LED or Bi xenon headlights, because of some irregularities or perhaps the standard feature from the factory, may as a result of this request for a custom facelift. As LEDs are becoming the biggest things in cars nowadays, the reason being that they have brighter lights, longer life, less power and faster response times. Various LED headlights have been created to fit into the various versions of the Range Rover sport such as the D1S/H7, H8, PY21W, W5W bulb types. As they have a rated voltage of 12V with a number of lights function to be around 5. A D2R 35W OEM Xenon HID replacement bulb type can be used in a number of applications from headlights, fog lights, spotlights, and basically anything else that uses a D2R fitment in your Range Rover Sport. You can also treat yourself to an amber PY24W 30W Cree LED indicator bulb. Not only does this bulb come as an upgrade from the standard indicator lights, it is also a positive enhancement to your driving style. Spoil yourself with a super amber color, super powerful 30W, a Canbus error-free not only that, it is very easy to install and you will not even need to take off your headlamp when installing it. It is highly compatible with other vehicles like Mercedes, Audi, BMW, and most especially Range Rover sport (2010-present) for as low as £19.50. Also at Enkahnz they also provide a 19cm universal COB Daytime LED light + indicator DRL. This is a high quality LED Daytime Running Light with a working voltage of DC12V/24V, a working current of 720mA/450mA, consumed power of 35W/pcs and is suitable for a voltage range of 9V -30V, with a lifespan of 50,000 hours. Not only do they provide the best upgrade materials, they also have in stock aftermarket lamps which are almost identical as the original especially their Range Rover Vogue L322 LED rear tail lamp, cluster light which fits perfectly into a 2010-2012. This tail lamps which comes as a facelift lamp, that is brewed from an high quality polished plastic, designed to adorn your Range Rover Vogue with a modern/stylish black inner housing £279.00 Looking forward to enhancing the look of your Range Rover Sport? You may want to try the dual row LED light bar with illuminated end caps. This additional adornment not only beautifies your vehicle, but it also improves your vision when driving at night and also adds an upgrade to your car ’s style and visibility by day. The exclusive combination of LED bulbs, flood or combo beams, and illuminated end caps, deliver brilliant illumination and a distinct one of a kind appearance. Most times, they last up to 50,000 hours or more, which assures you of utmost beauty for a very long period of time. You can also treat yourself to an LED Door sill Lights that illuminates the foot plate to give your Range Rover Sport L320 (2010-present) a distinctive eye watering appearance with the glow emanating from your ride. The sill lights which comes in 2 styling packs ( 2large and 2small) sill door lights. an high quality with mirror chrome finish, stunning blue illumination with ‘Sport’ style logo, and very easy to install illumination gives that extra touch of style and elegance only Enkahnz can provide at a very affordable price of £147.50. Puddle lights are also another way you can treat your ride to exclusivity. These LED puddle lights are designed to operate when you open the door of your vehicle to illuminate the floor below. The Range Rover logo is embedded in the LED lights. The lights can also be installed internally to illuminate the interior foot well of the vehicle. This is just to add personal touches to your ride. At Enkahnz, you can get your Range Rover SVO style shadow door ghost puddle lights, to further enhance the look of your ride with a very easy to install 12V voltage,3W powered, ABS+Alluminium alloy material, error free Canbus puddle light that is compatible with Range Rover SVO (2013) Model. Also, the Land Rover Range Rover style shadow Ghost light SVR body kit puddle light which comes in 2pcs, also powered by a 13W, 12V voltage, ABS+ aluminum alloy material, Canbus error free and very easy to install. This puddle lights is suitable for your Range Rover Sport (2010-2017), it is also compatible with Range Rover (2003-2012); LR2 (2008-2013); LR4 (2010-2012) ÂŁ29.95 and ÂŁ24.95. All these and more you can get on our page on eBay. 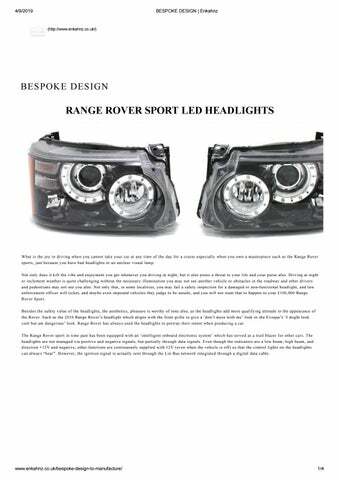 The Range Rover sport headlights, comes in various forms and prices, it is left to the owner to decide on the option that suits his taste best. An interesting thing to note therefore about lightning in Range Rovers is that, you have a wide range of choices to choose from, ranging from the standard company lights to the xenon lights, bi xenon lights, halogen, and many more. More so, for further personalization, you can pimp your ride with options like puddle lights, welcome lights, logo lights, LED bar lights, all this and more you can get at Enkahnz where your dream will be actualized into perfection.